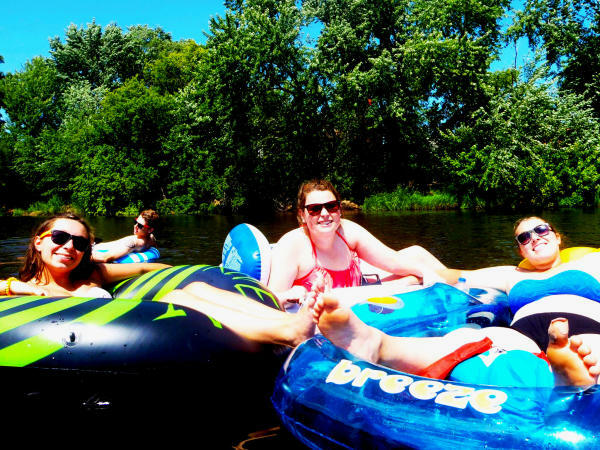 With freedom comes responsibility, especially when it comes to staying safe while doing fun things like floating down the beautiful Chippewa River. It&apos;s important to keep a few things in mind before heading down with your floaties and friends. It can be risky to float as a loner. The current picks up in certain places, and you may need a buddy to help you out in case something goes wrong. Linking up with a couple of friends on their floaties can be a lot more fun, too! Your classic flip-flops will work just fine! You may want to hold onto them in your tube or tie them to something so they don&apos;t float away. Having foot protection is important to keep you from scraping your foot on the rocks when you&apos;re getting in and out of the river. As mentioned before, some parts of the river rush harder than others. Although it&apos;s no whitewater rafting, you should be aware of your float route. Debris and trees also can be hanging in the water, and some sections flow past cement bridge pillars. Just be mindful of your surroundings. If you choose to bring a beverage that fits in your tube&apos;s cup holder, don&apos;t bring one that&apos;s in a glass container! If it accidentally breaks it could hurt you or the next person that steps in the river. In Wisconsin, we should already know how to protect ourselves from the scorching summer sun, but when relaxing on the water with no shade, it&apos;s always best to take extra precautions. Some ways to do that are to wear a hat, lather on the sunscreen, opt for a one-piece swimsuit and don&apos;t forget a pair of sunglasses that won&apos;t easily slip into the water. The river doesn&apos;t get drastically deep, and you should be able to stand in most sections, but you should be confident that you can at least doggy paddle if needed. It&apos;s always better to be safe than sorry. If you see someone in distress, help them! Get more help if you aren&apos;t sure you can assist them yourself. Following these few simple guidelines can ensure that you have an enjoyable time on the smooth Chip. Don&apos;t forget to look around at the local sights like UW-Eau Claire and Phoenix Park as you float past. Share your photos with us by using #CaptureEC. Be careful with your phone on the river, though!